Temple EWB travel team with members of the community. From Philadelphia to Pennsauken to Portland, Maine, many area college students took a break from the heat and splashed their way into summer break this year. For the Temple chapter of Engineers Without Borders (EWB), water was also an important component, but in a different way. 5.5 million Peruvians do not have access to potable water and 11 million lack access to indoor plumbing or waste removal. 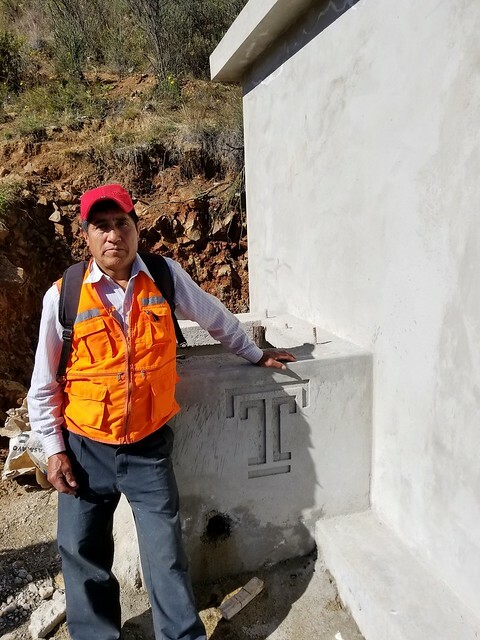 The Temple EWB group recently completed its third in a series of five trips to Saccha, Peru, where just over a dozen homes dot the remote mountainous agricultural village, to help design and construct a clean water distribution system. In other words, a typical summer break this was not. “Since we only had eight days in the community, our primary goal was to build the critical parts of the system and have water at the community tap stand by the time we left,” said Andrew Bertolazzi (CE, 18). Incorrect data from the previous trip meant the team had to resurvey the pipe route from the springbox to the storage tank, a route benefitting from simple gravity flowing the water from the spring at the top of the mountain. “Since the water was coming directly from the collection box at the spring, there was very little pressure in the pipe. We had to ensure that the pipe was angled at a consistent grade downhill so that the water would flow to the storage tank,” Bertolazzi said. The team borrowed a station from the regional government through their NGO partner as a remedy. “We had to spend four days resurveying the line while laying the pipe to get flow to the storage tank and this delayed us elsewhere,” Bertolazzi said. This, after a significant bit of travel from Philadelphia, to Miami, to Lima to Otuzco to the village. Their trip also included student translator Kathleen McCarrick, along with Dr. Graciela Jaschek from the College of Public Health, who helped communicate design changes with masons and nutritional issues in the community. Dr. Jaschek also collaborated with a local doctor and a representative of the high school in Otuzco to assess what public health interventions the new chapter of Public Health Without Borders could accomplish, while engineers planned for their final visits. “Our next trip will oversee the installation of the chlorination and work with the regional government’s health board to train the community members on how to disinfect the water,” Bertolazzi said. “We’ll also reassess if anything has changed with the community size or their daily water demand. The group must also wait a year for the final visit: more of a monitoring visit to gather community feedback on the system’s operation and troubleshoot issues, along with observing final data about water quality and the public health of the community. For now, Bertolazzi and the rest of the team are getting back into classes on campus, reflecting on how they applied what they learned here to their work in Saccha. “I used principles from fluid mechanics to try make new design changes in the field, and continually adjusted our hydraulic model to see if each house was still receiving adequate pressure,” Bertolazzi said, while adding a note about the differences in design and construction between the two countries. The group’s service in Saccha is nearing the finish line. In Peru, public health is expected to rise and susceptibility to waterborne diseases is expected to decline. For the Owls, their real-world engineering skills have been strengthened by the impact they have made as a team. See some of the photos from the team's trips, below. Since we only had eight days in the community, our primary goal was to build the critical parts of the system and have water at the community tap stand by the time we left.